When your snowbird home is near Orlando, FL you get visitors from the north who want to visit the theme parks. We would love to join them but they are so expensive to get into these days. I started to wonder if there was any way to get discounts to make a visit a little more affordable. I found out that all of the parks give some kind of discount or easy payment plans to Florida residents. That's perfect for us because we decided to stay 6 months and a day in Florida and we are now officially residents. Disney World - I was surprised to find any discounts here but I actually found a couple of options that would work for us as Florida residents. There is a 3 day ($159 plus tax) or 4 day ($179 plus tax) package that we could purchase and be able to use between Jan. 4 through June 24, 2018. The tickets can be used to enter any of the Disney parks but only one park per day. Considering that a one day adult regular ticket for Magic Kingdom costs a minimum of $119 plus tax, (regular ticket price, prices are higher at peak times of the year) this is an amazing deal. If we think we will be visiting the parks more than 3 or 4 times, we might consider getting one of the annual passes. Anyone can buy an annual pass to Disney but Florida residents have a choice of two additional options not available to the general public. The Disney Silver Pass ($439 plus tax) gives us access to all 4 parks, park hopping and parking. There are blackout dates, though, which are basically the weeks that schools are closed. The Disney Weekday Select Pass ($289 plus tax) is the same as the Silver except that the weekends are also blackout dates. I am thrilled with the Florida resident deals. We will definitely take advantage of these deals if our guests want to do Disney when they visit. If you are not a resident: The cheapest way to buy tickets through Disney World (see other options below) would be to buy them online. If you are planning to visit the parks 3 or more times within 14 days you can save $20 compared to what you would pay at the window. There are also annual pass options for non-residents. Universal - It costs $115 plus tax, at the cheapest time of the year, for a non-resident to visit Universal, and a little more at peak times. But we can take advantage of resident pricing here. 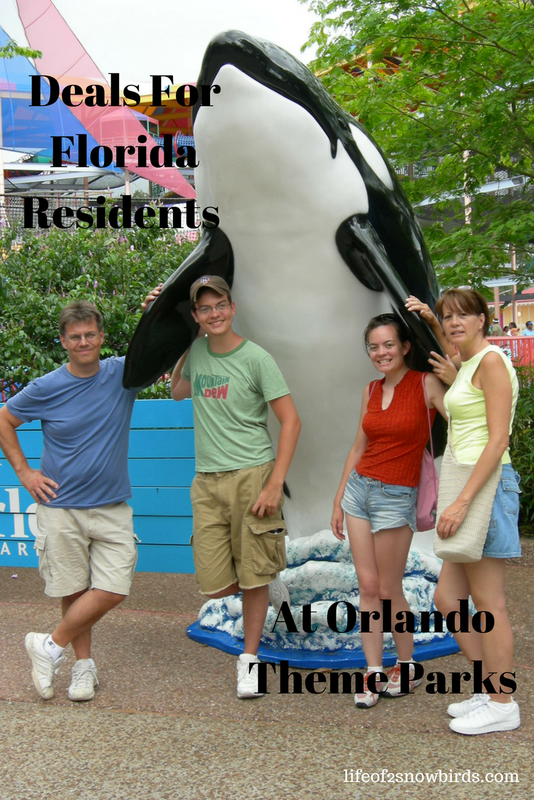 For $164.95 plus tax we can visit one park per day, Universal Studios or Islands of Adventure, 4 separate times. Or if we think we might want to make more than 4 visits to the parks, we can buy an annual pass for as low as $259.99 plus tax. Right now there is a sale going on that gives us 3 extra months free when we buy an annual pass. This makes this deal really worth the price. There are blackout dates but will still work for us right now. It will not work when our grand kids get to be school aged though! If you are not a resident: There is a deal here that is hard to pass on if you are planning to visit the parks 5 times in one week. The ticket will cost you $224.99 for 5 admissions, which is the same price you would pay if you were buying a package of 3 one park per day tickets. It's like getting 2 days free! Sea World - The cheapest way to purchase tickets for a day at Sea World is to buy them at least one day ahead of time online. The ticket will cost $79.00 for non-residents and residents alike, instead of $99.00. There are no Florida resident discounts here unless you are a teacher. The only perk a resident could get would be to be able to make monthly payments when purchasing an annual pass compared to having to pay in full. The annual pass is $175. Parking is included and there are no blackout dates which makes this a very good deal even without a discount. Busch Gardens - The only deals you can get here as a Florida resident is free yearly passes for Florida preschoolers and, like Sea World, you can make monthly payments when purchasing your annual pass. So whether you are a resident or non-resident, your annual pass is $168 and includes unlimited visits with no blackout dates, free parking, the ability to purchase tickets for your guests at a discounted price and other perks. A one day, one park ticket costs $89.99 and parking costs $18.69. It is definitely worth thinking about buying an annual pass and spending two days at the park. It would mean your second day would cost only $60.00 and would include parking. Legoland - For only $99.99 Florida residents can purchase an annual pass. The perk that makes this really worth buying is the $25 discount you can get for your guests, up to 4. Saving up to $100.00 on tickets for our guests sounds like a great deal to me. Cypress Gardens was the theme park here before Legoland. I was thrilled to know that Legoland kept the gardens and their website claims that it is even more beautiful than ever. I always loved those gardens and the fact that Legoland is only about 30 minutes from my Florida home makes me think we will take full advantage of the discounts we can get here. If you are not a resident: Buy your tickets at least 2 days in advance online and you can save $14.00 per ticket. A one day ticket costs $88.99 at the gate. There is a annual pass available to non-residents that will cost you $149 and will get you a full year of admission to the theme park and water park with no blackout dates and includes parking. You also get unlimited admission to the Coca Cola Orlando Eye, SEA LIFE Aquarium and Madam Tussauds in Orlando. (For more information on these amusements see our recent blog post here.) This is definitely worth looking into if you were planning to enjoy more than one visit to Legoland on your vacation. There are great deals for us now that we are Florida residents. We will look into deals we can get in other ways too before I buy our theme park tickets. I know we can buy discounted tickets with our AAA membership . We have also gotten a great deal for Busch Gardens when we purchased tickets online from visitorlando.com. Groupon and Trip Advisor are also worth taking a look at. An added bonus is getting 4% back from Ebates when you buy tickets through Trip Advisor and 9% through Groupon. Do you enjoy any perks in the city you reside in? So many things to see in Orlando. Yes. Hope you get to visit here one day. I'm so glad you linked up with Party in Your PJ's! 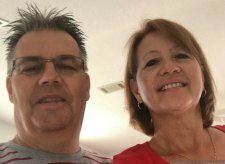 My husband and I are retiring this summer and plan to sell our home & live in a 5th wheel for a while. We will need all of the discounts we can find! I hope you enjoy your retirement as much as we are. I would have loved to do what you are doing but my husband is not too adventurous! I will be checking your blog to see how things are working out. Best of luck and enjoy!! I am so envious! We love going to Florida and there are such great deals there. Thanks for sharing on To Grandma's House We Go! Thank you for hosting such a wonderful party every week! Yes. So happy that we can take advantage of the discounts. I hope your brother takes advantage of the discounts he might be able to get.